Although we need to get back to blogging about some sports here at The Bench Jockeys, baseball has not started its pennant run, the NFL is still in pre-season mode and tennis’ US Open is not for two weeks. What has heated up, however, is the race for GOP Presidential Nomination. The first measuring stick for the candidates, the Ames Iowa Straw Poll, concluded voting last nite. Michele Bachmann snakes a win in the poll, with Ron Paul finishing second and T-Paw taking show. But just like kissing your sister, 3rd place is not what Pawlenty was setting his sights on. 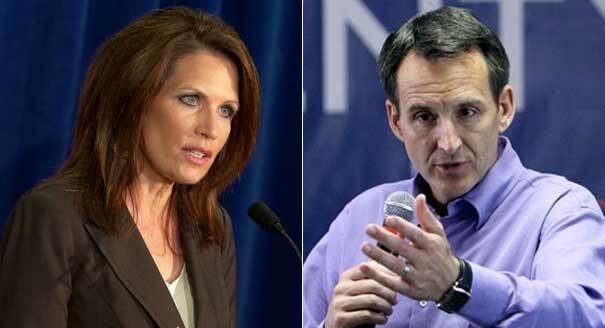 Apparently with Tim Pawlenty’s coffers beginning to run dry and his loss to fellow Minnesotian Bachmann, coupled with the entry of Rick Perry into the fray, Tim is pulling up stakes and calling it a campaign. As a result of this stunner, we have adjusted our top two tiers. Paul’s second place finish in Iowa, does not move his dial, but Bachmann gets a big uptick and Perry becomes the new #2 to Romney. For those of you asking, “Where is Mitt?” Ronmey did not compete. This entry was posted	on Sunday, August 14th, 2011 at 10:02	and is filed under The Quick Hook, US Politics. You can follow any responses to this entry through the RSS 2.0 feed. You can leave a response, or trackback from your own site. As an Iowan it’s always interesting how many out of state pundits get excited about the straw poll. There are many stories of organizers getting straw poll participants to vote for the weak. Then there is the issue of “representative sampling” – only a few extremests participate. The results are about as helpful as polling the bus boys at the Olive Garden. But don’t be confused, we appreciate all that big city money that comes out here to the watering hole when the crew from ABC news shows up. Powered by WordPress v 4.1.26. Page in 0.162 seconds.